Local SEO is our agency's core competency. We spend countless hours researching and executing the best SEO practices. We test on a daily basis. We do it because our goal is and always will be to create more leads for our small business clients. Leads are what drives your bottom line, sales and ROI. Our Local SEO services deliver specifically on that goal. There are so many benefits from good SEO work. SEO will create greater brand awareness and increased traffic to your website. There are so many marketing companies out there who promise increased web traffic, but without context, they are nothing but anonymous clicks. We provide that context. We tell you where the traffic is coming from and provide unique content that gets the visitor to take action and become a customer. Don't Think SEO is Important? Think Again. When over 55% of ALL search traffic goes to the first 3 ranking companies, you had better believe that Local SEO is critical to your business. Ignoring these numbers is nothing short of burying your head in the sand. Placing the Scott McKellam Agency in charge of your Local SEO is a smart business move. Calculate the ROI of doubling the number of customers you have each month from your website. SEO makes business growth happen! What Makes the Scott McKellam Agency Unique? 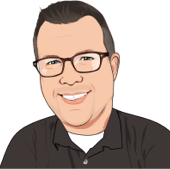 Our founder and Lead SEO Consultant, Scott Richardson started this company because of his dedication to small business. Scott bought and sold businesses, created startups, and worked for Fortune 500 companies. But his passion is serving blue collar business owners, and companies that make a living over the phone. If you are a large multi-national company, we're probably not for you. If you have more than 1,000 employees, we are probably not for you. We are champions for the "little guy" because we believe those are the businesses that make Northern Virginia a great place to live! We are specialists at making the phone ring and the email inbox full. Together with our unparalleled commitment to research and web strategy, our agency delivers results that go above and beyond. You will find bigger - but not better! At the Scott McKellam Agency, we deliver top results through organic search engine optimization. There are a lot of firms out there who say they provide SEO services to local businesses, but only a few have the expertise necessary to produce continued improvement in search engine rankings. And frankly, ranking are nothing without conversion. We are never satisfied with high rankings. Because neither are you. You want to count customers...not clicks. That's why you should choose the Scott McKellam Agency. We understand business. For instance, we know that online reviews matter. Getting customers to give you positive reviews online means you'll rank higher. We have shown time and again that we can execute successful Local SEO campaigns in most blue collar and service-based industries. We are focused on critical on-page and off-page SEO factors that can move you up the Google ladder. On average we get a 96% increase in search engine traffic for our clients after the first year. Those are quantifiable results that make a huge difference to your bottom line! We look for you to get visitors that stay longer and pay longer! Our core value is search engine optimization through an organic process of building an authoritative reputation with search engines. Our Fairfax, Virginia SEO agency is packed with a team of SEO specialists who are committed to researching the most innovative and sustainable techniques to improve your site’s search engine rankings. We provide clients with real SEO strategies that produce quantifiable results.